Specializing in landscape irrigation design, installation, and maintenance. Our continuous efforts keep us up to date on the latest water-saving advancements in irrigation innovative products, techniques, and smart technologies, all in pursuance to best serve our clients. An automatic commercial irrigation system is a cost effective investment, decreasing the daily business expense of maintenance personnel, in addition to its efficient use of water. An irrigation system will ensure health and beauty of your commercial landscape, enhance curb appeal, attract new customers, and increase the value of your place of business. 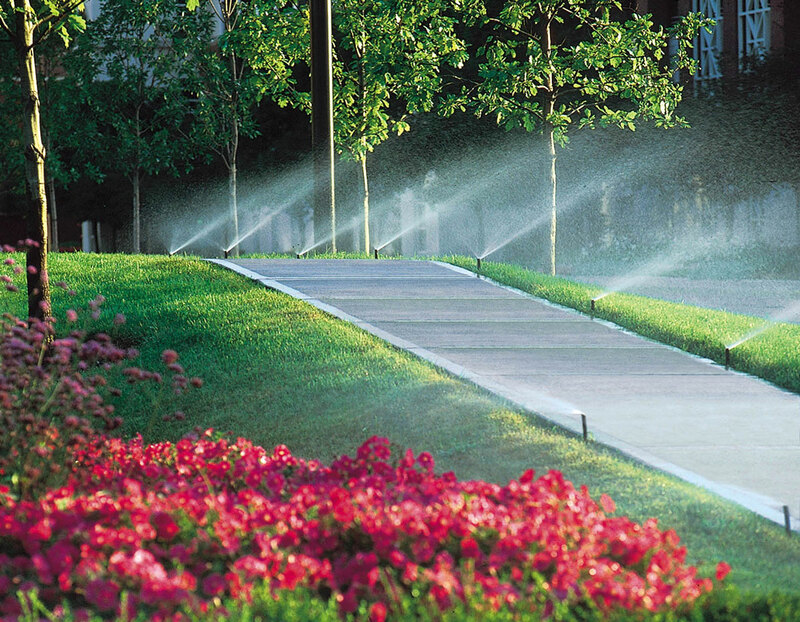 Sprinkler Solutions will design and install the correct irrigation system specifically engineered to meet the needs of your commercial landscape. We understand the conditions of completing your project on time and within budget. We are trained and experienced in the advanced installation of 2-wire decoder-based irrigation and central control systems. A professionally installed irrigation system by Sprinkler Solutions is an investment to years of worry-free watering. 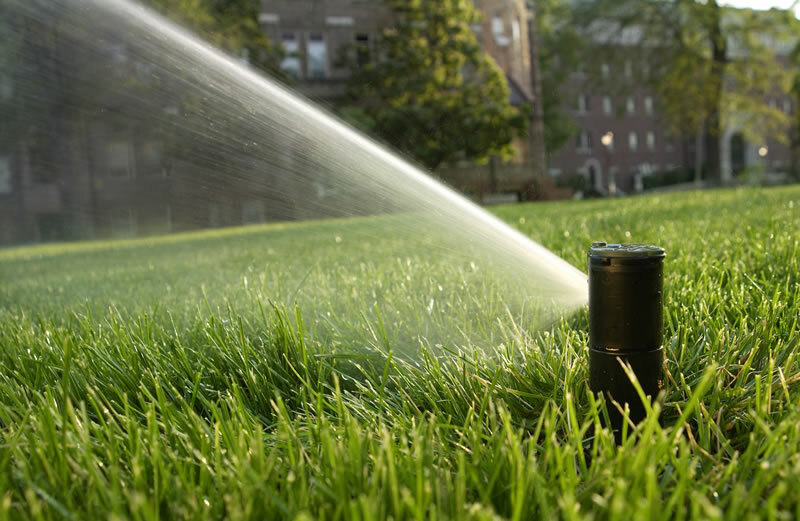 We provide a complete commercial irrigation system package including comprehensive planning and consultation, irrigation system design, irrigation system installation, service, and maintenance plans. Foremost, we will discuss your goals, assess your watering needs, and offer beneficial solutions to fit within your budget. An on-site evaluation is necessary upon the design of your irrigation system as we analyze many relevant factors, including water source and location, water quantity and quality, water pressure, flow rates, property measurements, elevations, soil type and texture, diverse plant materials, plant size and location, root depth, microclimates, and weather conditions. Our design process will select the correct components, minimizing water in the most efficient manner possible, relating to smart systems, check valves, rain sensors, soil sensors, and drip irrigation, while providing the proper amount of moisture needed to support your landscapes deep root system. In addition, our irrigation designs allow for expansion should you remodel or upgrade your landscape. Sprinkler Solutions will install your irrigation system right the first time, as this is a crucial element to system performance and longevity. We install Rain Bird Professional Series Products, assuring long term performance, durability, and years of reliable operation. We install vital components such as valves in areas out of way of traffic. More often than not, irrigation components may be visually noticeable, as we conceal your components in inconspicuous locations. We pay close attention to specifics such as matched precipitation rates and 100% head to head coverage. We integrate our irrigation system techniques minimizing any surface disturbance. Upon completion, we perform a final walk through, including hands-on personal training, thoroughly explaining and demonstrating how to operate your irrigation system with ease. We provide a detailed as-built of your commercial irrigation system design layout in its entirety for future reference. 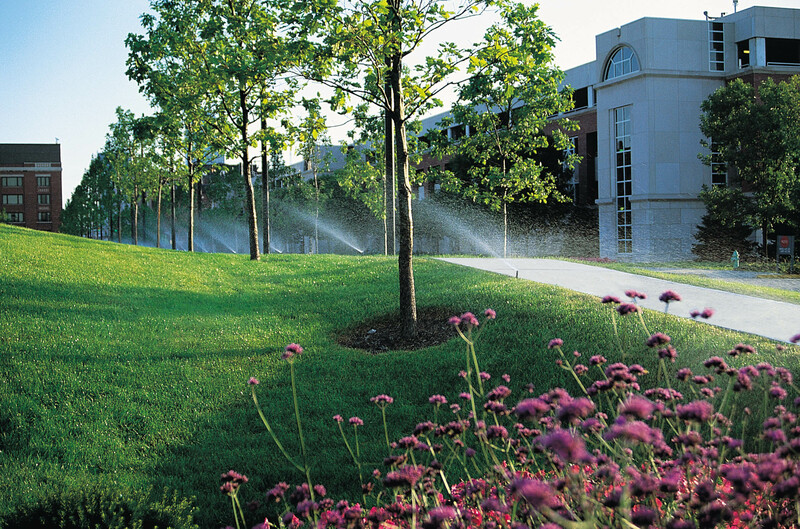 Our water efficient designs and effective installations provide commercial landscapes proper hydration and uniform coverage. Our timely service and maintenance extend its longevity, ensuring optimal landscape health and a flourishing green appearance. Drip Irrigation is the most efficient and valued application, specially designed to direct water to each plant’s root zone while maintaining optimal moisture levels within, resulting in longer healthier plant life. Plants thrive on a consistent schedule of water to preserve nutrients. In return, much healthier deep root systems will develop. Drip irrigation is best applied in flower beds, flower pots, hanging baskets, window boxes, shrubs, landscape beds, and vegetable gardens. Sprinkler Solutions provides a complete warranty on all system components, workmanship, and design for 2 years free from any defects, valid on all irrigation system installations. In addition, Rain Bird products are warranted for a period of 5 years from the date of original purchase. Sprinkler Solutions specializes in the design, installation, and maintenance of automated in-ground lawn irrigation systems and sprinkler systems for commercial buildings, industrial parks, healthcare facilities, manufacturing facilities, retail complexes, restaurants, athletic fields, and shopping centers. We provide high quality irrigation systems throughout the Dayton and Cincinnati Ohio areas, including Bellbrook, Clayton, Fairborn, Kettering, Oakwood, Northridge, Riverside, Spring Valley, Sugarcreek, Five Points, Liberty Township, Montgomery, Sycamore Township, Symmes Township, Washington Township, Waynesville, and more. If you are interested in obtaining an irrigation system quote, please feel free to contact us and schedule an appointment. We are certain that upon acceptance, you will be at ease in knowing you chose the highest quality irrigation system available. Request your no-obligation quote today!